In class we have been reading aloud a Big Head biography on Malala Yousafzai. She was a young Pakistani girl who loved to learn. Below is a clip about her. Please share with your child, if you would like. I think they would enjoy it as they are loving the book. 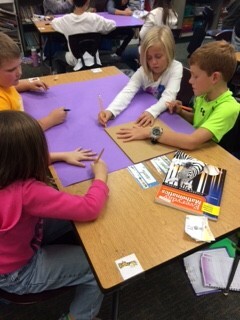 Students work on finding the area of an unknown length of paper. This week we worked really hard on theme and finding the themes to the books we are reading. We talked about how theme was like a crème filled cupcake. The Theme is the crème hiding inside every story. Try finding the themes in the stories you read at home. Past, present, and future tense verbs was the discussion this week in grammar. Our next skill will be making sure our subjects and verbs agree with one another. We have starting working on informational writing. We will continue to work on this skill after break and during Genius Hour. We will finish off our fact research after fall break with "survival/ adaptation" facts. We will then begin working on our binder pages. Don't forget to send in a color picture (full body) for art class before October 30th. Also, many still need to send in $5.00 for the binders/boards. A big thank you to all the parents who have taken time to donate time and items for our fall party.